Filming for personal use such as family events, weddings, graduations, parties, and other holiday activities are exempt from obtaining a film permit. Student film productions may also be exempt from obtaining a film permit. Please see the Frequently Asked Questions to determine if a student film production qualifies for this exemption. Film Permit Fee Calculator - if using Firefox, please use other browser to fill-out this form. The Planning Division’s Film Permit Monthly Report is now accessible on the County of Ventura Citizen Access website. 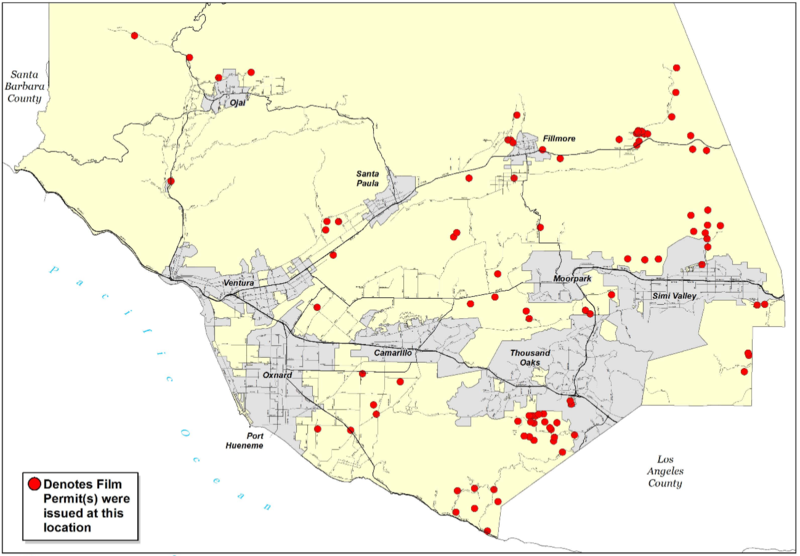 This report provides detailed information regarding all Film Permits issued by the County of Ventura Planning Division within the past 30 days. To view the report, you must register for a user account. If you need assistance in locating the report, please refer to the HELP page titled, “Reports Available in Citizen Access”, on the right hand side of the Citizens Access website. Film Permit Application has been removed - Starting January 2, 2018, all Film Permit Applications will need to be submitted online. Please visit the County of Ventura Citizen Access website and see the Film Permits information there. A film permit amendment, or "rider," is for minor changes after a film permit has been approved and issued. Required for every film permit. Send to the Ventura County Fire Department. Contact information for County agencies, city contacts, etc. Required if an agent signs on behalf of the property owner. Required when filming on County roads or right-of-ways. Search for locations, addresses, APNs, jurisdictions, and more on an interactive map. Search for the current owner of a property.